This summer I had several projects to work on, including an article on urban Madrid, two new syllabi to prepare, and a conference presentation in Salamanca on the film Las 13 Rosas. But I also took on another smaller project that allowed me to work on something slightly different than what I typically do as a Spanish language and literature professor – a book review of a recently published English language book: As I Walked Out Through Spain in Search of Laurie Lee, by British author P. D. Murphy. Granted, the book is set (predominantly) in Spain and is steeped in the history and culture of the country, but it is still a far cry from what generally constitutes my summer reading list. After reading the novel, I wrote a review for The Volunteer, the journal of the Abraham Lincoln Brigade Archives (ALBA). According to their website, ALBA is an educational non-profit dedicated to promoting social activism and the defense of human rights. Their work is inspired by the American volunteers of the Abraham Lincoln Brigade who fought fascism in the Spanish Civil War (1936-39). My original, and more concise review can be found on The Volunteer, but below I am posting a lengthier version that includes additional links, resources, and connections that may be of interest to professors or teachers of Spanish or literature. Once I started writing my review I found I had many more thoughts than would fit in a short 1,000 word post. REVIEW: P. D. Murphy, As I Walked Out Through Spain in Search of Laurie Lee (Bristol: Silverwood Books, 2014). In recent years, and especially during those of the nascent twenty-first century, the literary and cultural production of contemporary Spain has been rich in themes of historical memory – the recovering, remembering, and reconciliation of the nation’s tumultuous twentieth-century legacy of Civil War, dictatorship, and a somewhat fragile Transition to democracy. Some literary and cultural critics have even suggested that, for the majority of Spaniards, the brutal Civil War (1936-39) is today considered the most significant event in the history of their country, an event which must be confronted and revisited in order to understand present-day Spain (Bernecker 15). While celebrated Spanish authors like Javier Cercas, Dulce Chacón, Isaac Rosa, and Lorenzo Silva have penned narratives that address the complexities of the nation’s collective and personal histories, British author P. D. Murphy’s novel, As I Walked Out Though Spain in Search of Laurie Lee, reveals the perspective of a non-Spaniard – an “outsider,” so-to-speak – who nevertheless has deep personal connections to Spain. In this novel, Murphy’s desire to follow in the footsteps of his literary hero, English writer Laurie Lee (1914-1997), not only sends him on a personal journey through the history, culture, and geography of Spain, but also forces him to explore his own personal history and (present) identity. 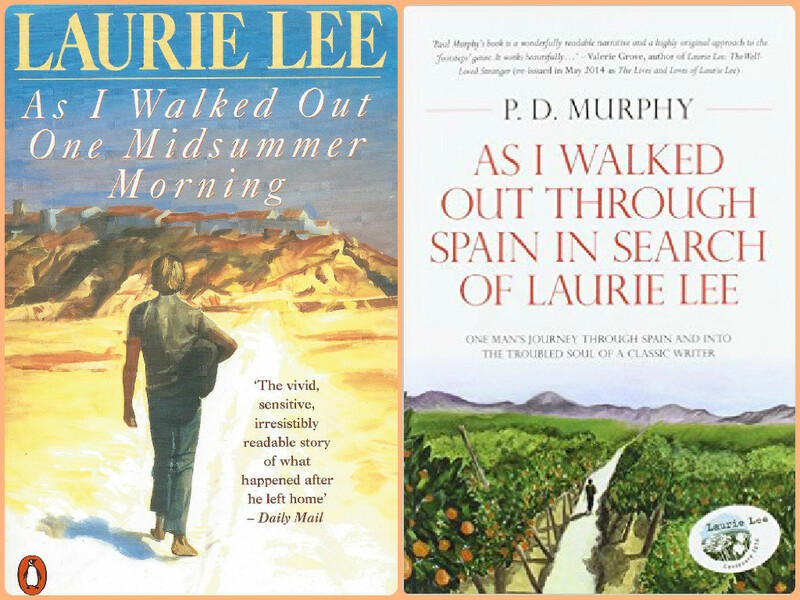 According to Murphy, his novel is a story of two journeys, on two levels: “Laurie Lee’s through Spain in 1935 and how it profoundly shaped the way his life unfolded; [and] my journey following in his footsteps across Spain in 2012 and how it has given me a second chance in life” (9). Indeed, Murphy is the first person to retrace the path across Spain blazed by Lee just prior to the onset of the Spanish Civil War. According to Christopher M. Keirsteak, footsteps travel writing is a growing subgenre of contemporary travel writing. In these narratives, writers retrace the routes of earlier travelers, and their resulting literary production is “highly intertextual and characterized by deem immersion in the discursive and personal space of the subject”. These “earlier travelers” can be famous explorers, well-known literary or artistic figures, or often merely a personal hero of the author preparing to embark on such a journey. Such is the case for P. D. Murphy, who had admired, studied, and revered Laurie Lee since his adolescence. While Lee’s 1935 walk from northern Galicia to southern Andalusia would later form the basis of his successful novel, As I Walked Out One Midsummer Morning (1969), a coming of age tale of a young man’s journey across an unfamiliar country that would enchant and inspire him, Murphy’s modern-day route culminates in the publication of this curious narrative that blurs the boundaries between fiction and non-fiction; between biography, hagiography, and autobiography; between past and present. Below is Murphy’s video describing his novel and his reasons for following in the footsteps of Laurie Lee. The book is structured chronologically, with dated entries that also indicate the place in which they were written: “25 June 2012, Madrid,” for example. Though Murphy’s path is recorded chronological, entries with dates ranging from the 1910s to the 1990s are interspersed, juxtaposed with Murphy’s present-day experiences. These samples of the past generally narrate Lee’s experiences, providing readers with biographical information on this English writer in rich narrative form. Murphy’s re-creation of Lee’s experiences for modern-day readers is often prompted by his arriving at the same place as Lee had, observing the same buildings Lee detailed, or breathing in the same colored landscape so poetically captured by his literary idol. There are moments when Murphy includes references to Lee’s poetry, using Lee’s words as a way of ascribing meaning to his own lived experiences. Clearly Murphy is not only an expert on Laurie Lee, but an avid fan and follower of both his professional work and personal life. In this sense I can relate to Murphy’s experiences of standing in the same place as one’s artistic inspiration – I wrote before about visiting each of Salvador Dali’s three museums in northern Spain, including his summer home in Cadaqués, the Museum he constructed in the town in which he was born (Figueres), and the Castle in Pubol that he purchased for his wife, muse, and lifelong companion, Gala. Indeed the journey across marked geographical spaces and particular moments in time is ripe for literary interpretation. The trajectory of the classic hero’s journey – Odysseus, for example; Don Quixote in the Spanish context; and even Harry Potter as a more contemporary example – is as much about the foreword progression of the (generally male) protagonist’s quest as it is about the process of self-recognition and identity solidification. Joseph Campbell’s book The Hero With a Thousand Faces is a seminal study of the hero’s journey, what he terms the monomyth. In just under five minutes you can learn about the main premises of the Hero and the Monomyth according to Campbell in the below TedEd Talk on “What Makes a Hero.” I discovered this short video it on Maria Popova’s excellent Brainpickings blog, which I linked to just above regarding the hero’s journey. By following in the path of his own literary hero, Murphy embarks on a journey that will not only connect him to Lee and his history, but also afford him clarity and acceptance with regards to his own personal history, identity, and experiences of loss. He confronts his rocky relationship with his father, for example, and learns to accept the dissolution of his marriage and his present relationship with his daughter. Yet to ultimately achieve this solace Murphy, like Lee before him, must set out from his familiar surroundings, navigate the unexpected roadblocks or detours of the foreign land through which he travels, and finally return home transformed, where he will reintegrate into the society he had left behind. At times the book becomes somewhat melodramatic in its telling of this this sort of male mid-life identity crisis, a narrative frequently repeated in contemporary film and literature, but I am willing to bet this is a common characteristic of “footsteps” travel writing given the process of identity formation that accompanies the narrated journey. The sense of place is what I found to be the strongest aspect of Murphy’s book, as evidenced by the aforementioned headings structuring the text. A map of the similar routes both Lee and Murphy took across Spain, in 1935 and 2012 respectively, is included among the novel’s foreword and introduction. On this single map of Spain the reader can compare the two pilgrimages and use the visual as a point of reference when Murphy’s narration makes significant divergences from or exhibits clear similarities with Lee’s initial route. Map of Laurie Lee’s and P.D. 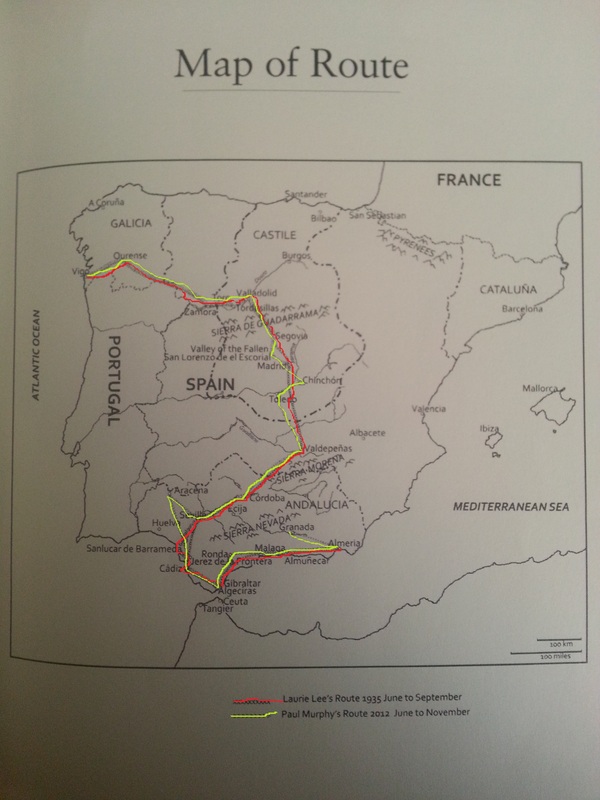 Murphy’s routes across Spain, from the Introduction of Murphy’s novel, “As I Walked Out Through Spain in Search of Laurie Lee” (2014). Lee’s route appears in red, Murphy’s in yellow (I traced the routes as best I could, since the the grey “x” and “-” did not show up well on the copy I made of the page in the novel). A perhaps self-conscious observation confirming the pertinence of place appears in Murphy’s musings during the second half of his narrative: “The essence of a place is made up of the people who live there and their stories” (154). Surely reflective of Murphy’s own philosophy, this line is fitting for a journey that includes a solemn visit to the Valley of the Fallen, Toledo’s Alcazar (that houses the National Museum of the Army), and a stop in a small local bar in Cádiz that resulted in an intimate conversation with a young gypsy musician. The descriptions of the northern Galician countryside and the southern landscapes of Andalucia are perhaps the most vivid in the book. It was a pleasure to read these after having spent time last summer (2014) in Santiago de Compostela, and having just returned this July (2015) from a visit to Spain that included several days in Granada and a day-long visit to and tour of the magnificent Alhambra (below). While the sense of place is crucial to capturing the spirit or soul of the Spanish nation (its duende, as Murphy accurately refers to it) and the protean Spanish countryside that both writers so dearly love(d), the role of History is equally as important in As I Walked Out Through Spain in Search of Laurie Lee. Personal connections to Spanish national history and the debate surrounding the nation’s historical memory feature prominently in contemporary Spanish cultural productions. For a nation whose transition from dictatorship to democracy in the late 1970s was marked by a philosophy of “forgetting the past” in order to look towards the future, the notion of recovering and acknowledging a traumatic history is a heavy cross to bear. Murphy’s book captures the complexities of Spanish attitudes towards the nation’s history by recounting interactions with Spaniards throughout his journey. Late in the book, for example, a Spaniard and his American-born wife reveal their opposing views with regards to the question of exhuming bodies from sites purportedly containing mass graves. His is representative of the more conservative viewpoint: the war is over and Spaniards should attempt to live in peace by not meddling with the past or disturbing the dead. His wife is of the opposite opinion, generally supported by those with Republican ties or members of younger generations: the dead deserve justice, respect, and honorable burials, just as the victors who supported the Francoist cause received upon the war’s end. Murphy’s conversation with this couple certainly reveals the way in which the interplay of historical memory and amnesia affects contemporary discussions of the violence and trauma of the Civil War, exile, and dictatorship. As an outsider, Murphy refrains from engaging passionately in such discussions, though a careful reader will notice that his views most closely align with those in favor of recognizing Spain’s past sins. As I Walked Out Through Spain in Search of Laurie Lee is an enjoyable and informative read for anyone interested in the life or writings of Laurie Lee, the ghosts of the Spanish Civil War that still haunt Spain’s psyche, or the geography, history, and people of 20th-century Spain. What English-langauge novels have you read that take place in Spain (besides Hemingway’s The Sun Also Rises)? Have you used English-language fiction hen teaching classes on Spanish Culture or Civilization? Altmann, Werner, Walther L. Bernecker, and Ursula Vences, Eds. Debates sobre la memoria histórica en España. Berlin. Tranvía, 2009. Essays in Spanish and German. This entry was posted in Literature, Spain, Spanish Civil War and tagged books, fiction, Franco, hero, history, journey, Laurie Lee, Spain, spanish civil war, travel. Bookmark the permalink. Rebecca Bender is a participant in the Amazon Services LLC Associates Program, an affiliate advertising program designed to provide a means for sites to earn advertising fees by advertising and linking to Amazon.com. Many of my links to recommended books will take readers to Amazon.com. A review site dedicated to the diverse world of contemporary fiction. Diálogo entre culturas, de lo local a lo global.